April 16, 2019, 2:00 p.m.
More than four in ten (46%) Americans say that if they were looking to invest money, they would be very or somewhat likely to consider investing in cannabis. Americans making $100K or more are slightly more likely (50%) to say they would consider investing in this sector, while people who live in an urban area (52%), or are a parent of a child under 18 (58%) are also more likely than most to say they would likely invest. Those who have ever used recreational marijuana (81%) are by far the most likely to say they’d consider investing in the cannabis industry. Men (49%) are more likely than women (42%) to say that they would consider investing in the cannabis industry. More than one-third (36%) of women say that it is “not at all likely” they would consider investing in cannabis. 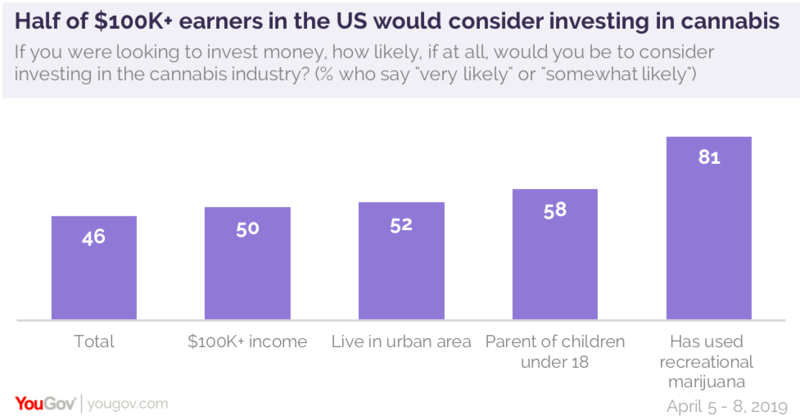 Members of Generation X (53%) and millennials (49%) are both more likely than baby boomers (41%) to say that they would be likely to consider investing in cannabis.